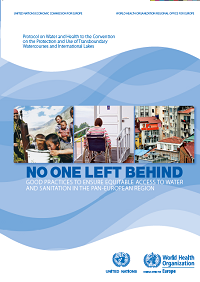 No one left behind: Good practices to ensure equitable access to water and sanitation, launched today, 13 March 2012, at the sixth World Water Forum in Marseille, France, highlights significant inequities in access to water and sanitation in the pan-European region and provides guidance on how to redress them, showcasing successful policy and practical measures that have been taken by Governments, water operators and civil society. The world has met the Millennium Development Goal (MDG) target of halving the proportion of people without sustainable access to safe drinking water, according to a report issued on 6 March by the WHO/UNICEF Joint Monitoring Programme. Globally, 89 per cent of the world population or 6.1 billion people now have access to improved water sources which is one per cent more than the MDG target. While this news is encouraging, it hides important problems related to water quality, affordability, and inequities in access. In addition, the world is still far from meeting the MDG target for sanitation, and is unlikely to do so by 2015. Significant efforts still need to be made to ensure that access to water and to sanitation is safe and equitable for all members of the population, including in the pan-European region. Moreover, “political commitment and strong water governance are needed to make [this] a reality,” stressed Andrey Vasilyev, UNECE Deputy Executive Secretary of, at the launch of the publication. And since the recognition of the human right to water and sanitation by the General Assembly of the United Nations and the Human Rights Council in 2010, ensuring access to water and sanitation for all is no longer simply an aspiration: it is now a legal obligation for Governments. Geographical differences. Access to improved water and sanitation solutions in rural areas in the pan-European region is 10 per cent lower than for urban areas. Investment programmes, subsidies and promoting efficiency and rational prices in areas with higher costs of service can help reduce this gap. In Portugal, some more sparsely populated regions of the country benefit from investment and operational subsidies in order to ensure affordable water prices, while safeguarding the long-term sustainability of operators. Discrimination or exclusion in access to services by vulnerable and marginalized groups. The disabled or the sick, Travellers, the homeless, people living in unsanitary housing or users of institutional facilities (hospitals, schools, prisons, refugee camps, etc.) often suffer from inequities in access. Social inclusion policies need to pay attention to their special needs and affordability standards need to take account of their abilities to pay for services. Several French cities inform and orient homeless people regarding public water and sanitation facilities through water maps distributed by social centres and non-governmental organizations. Affordability for users. The increasing cost to consumers of water and sanitation threatens the affordability of access to water and sanitation, not only in transition economies but also increasingly in European Union countries. Tariff design and social protection measures are key to addressing affordability concerns, relying on financing from other water users or taxpayers. The Ukrainian Government adopted a housing subsidy programme that sets a ceiling for housing-related expenses, including water and sanitation, as a percentage of household income. The publication is available at: http://www.unece.org/env/water/publications/pub.html. The UNECE/WHO-Europe Protocol on Water and Health to the Convention on the Protection and Use of Transboundary Watercourses and International Lakes (Water Convention) aims to provide universal access to water supply and sanitation. The quality of the water supplied should be adequate and must not constitute a potential danger to human health. This includes the protection of water resources which are used as sources of drinking water, the treatment of water and the establishment, improvement and maintenance of collective systems. To this end, the Protocol requires Parties to take positive measures to assist individuals and communities to enjoy access to safe water and adequate sanitation, measures which are tailored to the countries’ social, economic and environmental conditions. Moreover, the Protocol includes far-reaching provisions on public information, public participation and access to justice, public awareness and education. It also includes provisions on the international duty of solidarity, requiring Parties to assist each other to achieve the objectives of the Protocol. The Protocol also contains provisions on non-discrimination. In particular, it requires that “equitable access to water, adequate in terms both of quantity and of quality, should be provided for all members of the population, especially those who suffer a disadvantage or social exclusion”. The Protocol thus illustrates and embodies the close linkages between human rights, health, environmental protection and sustainable development. As Party to the Protocol on Water and Health since 2005, France is leading and supporting activities on equitable access on this area under the programme of work.